Belize is a poor country with a weak but functioning democracy. The Mesoamerican reef and its associated watershed supports tourism and fishing, which along with agriculture, are the primary sources of jobs and income. All the principal political organizations in Belize are committed to raising the standard of living, and support the continued growth of tourism as well as other job creating initiatives. The reef is already threatened by degradation in water quality due to increased human activity. Climate change will further reduce the carrying capacity of the reef at precisely the time that population growth and rising expectations will create demand for more rapid development. Efforts to ensure a coherent approach to development and the long term sustainability of the Mesoamerican reef are further complicated by the fact that Belize, Guatemala, Honduras and Mexico all claim soverignty over significant portions of the reef. A long term border dispute with Guatemala hampers cooperation on protecting the reef and the western portion of the watershed. While the current level of conflict is low, any dramatic decline in the health of the reef will put enormous strains on civil society in Belize and cold lead toincreased conflict in the region. The government of Belize has made an effort to towards sustainable development. Unfortunately, the governments of Guatemala and Honduras are realtively weak and enen the few existing environmental regualtions are rarely enforced. This patchwork approach to managing development bodes ill for the long term health of the reef. Photo source: Colorful CostaMaya: http://www.ssqq.com/travel/rhapsody200604.htm. Belize and the Atlantic coasts of southern Mexico, Guatemala and northern Honduras. Sovereign Actors: The governments of Belize, Guatemala, Honduras and Mexico. Other actors: International investors in tourism, petroleum exploration, and aquaculture. Local political parties and international NGOs advocating for conservation also have a significant stake in development decisions. The Mesoamerican reef is currently threatened by deforestation (leading to a decline in water quality), pollution and overfishing. Tropical. Ocean. Coral reef and associated watershed..
A. 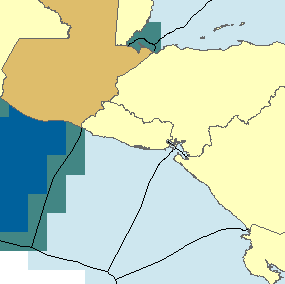 Act: Atlantic Coasts of southern Mexico, Belize, Guatemala and Honduras. The reef is threatened by many types of development and exploitation. As can be seen in the map above, the water quality of the reef is susceptible to contaminated runoff from a large area. Causes of contaminated runoff include agricultural development. deforestation and municipal waste. Tourism is both a growing source of jobs and income and, potentially, a massive threat to the health of the reef because of the development of new hotels and the related real estate boom. Both Belize and Guatemala have begun to develop their limited but significant oil reserves and extracting, storing and shipping oil certainly increases the opportunity for environmental accidents. For additional information on how proposals for off shore oil drilling could threaten the Mesoamerican reef, see Conference on off-shore oil exploration. The long term outlook for Belize is further threatened by three additional factors. The first is Guatemala€™s continued claim over the territory of Belize, a fact which does little to encourage Guatemala to respect Belize€™s Economic Exclusion Zone. The second is increasing spillover of drug violence from Mexico and Guatemala into Belize. The third factor is that, like the majority of the coastal population of Belize, the communities on the Atlantic coasts in Guatemala and Honduras are predominantly of African descent, and have been routinely discriminated against by their own central governments. This historical reality encourages the central governments of Guatemala and Honduras to focus on the reef as an opportunity for investment rather than as an essential resource that needs to be protected to sustain healthy local communities. The primary significance of climate change is that th projected climate change will lead to a gradually reduced carrying capacity for the reef and the watershed at precisely the same time that political pressures will encourage decisionmakers to view the carrying capacity in the most optimistic manner possible. Even absent the expected impacts of climate change the Mesoamerican reef is already being degraded by what could be described as €œroutine€ development. The coastal economy is dominated by the rapid growth of tourism and fishing. The watershed economy is dominated by logging and agriculture, with oil production becoming an issue of increased importance and economic concern. Regulations, such as they exist, are often ignored. Large portions of the watershed are virtually ungoverned. The fact Belize is a democracy and that the major parties are committed to improving the standard of living of the entire population presents an additional challenge to sustainable development and conservation. In a democracy political parties win elections by delivering goods and services. The political imperative to create jobs for a growing population will tend to frame the debate as being between €œprotecting scenery€ (conservation) and "creating jobs" (development). Any leader who wants to be re-elected will be under pressure to support development because development produces jobs and increases income. This pro-development pressure comes from a combination of the short term interests of the electorate and the long term interests of investors. Unfortunately, both groups will have every incentive to minimize the risk of any single specific development project to the health of the reef. Local skepticism towards conservation laws is a common problem, especially when conservation can be portrayed as an attempt by outsiders (e.g. Western governments and International conservation organizations) to limit the economic opportunities available to the local population. This phenomenon has been observed across time and cultures: in Bolivia indigenous people opposed the creation of bio-reserves just as in the United States local ranchers and businessmen opposed the creation of Yellowstone national park and continue to chafe at Federal interference as to what they can do with €œtheir land.€ In a few cases an autocrat has been able to force conservation upon an unwilling body politic (examples include Theodore Roosevelt€™s executive actions to create the U. S. National Park System and actions by the dictator Rafael Trujillo to protect the forests in the Dominican Republic). In other instances grass roots political action has led to a long term political consensus about the importance of conservation and sustainable development (e.g Costa Rica). One of the recurring challenges for conservationists has been convincing local stakeholders that the risks of development equal or exceed the benefits. Political action in support of sustainable development requires the risks be both tangible (a threat to local culture and/or health) and credible (the data is clear and the public believes the information). The following diagram illustrates the ways that key stakeholders influence a development decision. Note that for local communities to have any significant influence they must have two things: the first is political influence (i.e. they need to be seen as stakeholders) and the second is an internal consensus about the level of risk posed by the proposed development action. Bottom Line: Doubt about the long term risk enables leaders and voters to rationalize a decision to focus on short term benefits. Politicians will be tempted to use doubt as a way to justify development that has the potential to win votes. If conservation requires a consensus about the risk posed by development then it follows that a goal of pro development forces is to highlight the benefits and downplay -- and create doubt about -- the risks. The supporters of aggressive development have the advantage of being able to talk about specific short term economic benefits (jobs, income, etc) from any given project while the supporters of conservation are often attempting to focus stakeholders (who may well need jobs now) on long term risks. Unfortunately, any government committed to reducing poverty is going to be under enormous pressure to minimize the risks posed by any specific project that promises jobs and economic development. 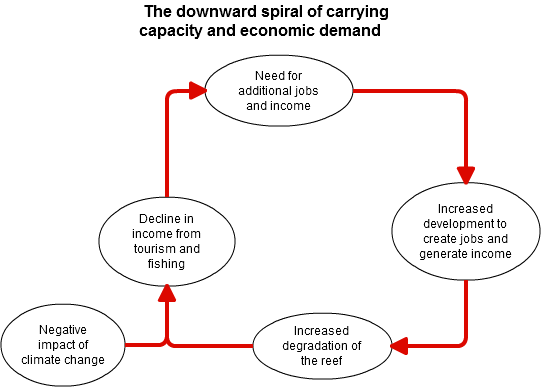 There are two potential paths that could lead to domestic political conflict: the first is that tourists come to Belize precisely to experience a healthy reef and at some point a combination of development and climate change might degrade the reef and destroy the very experience that has lead to the growth of tourism. Any decline in the number of jobs created by tourism would create enormous pressure to expand other forms of job creation. Unfortunately, for Belize, the same degradation of the reef that might lead to a decline in tourism would likely lead to a contemporaneous decline in fish catch. A decline in Belize€™s two most important economic sectors would put enormous pressure on Belize€™s relatively weak government. 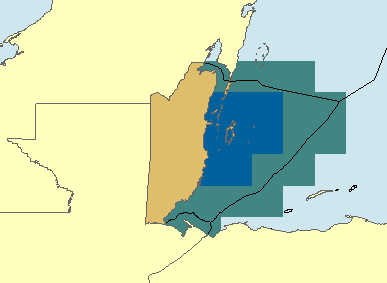 Belize EEZ shows Atlantic coast areas on right. Guatemala borders Belize to the West and the North. Guatemala EEZ shows Atlantic coast on right and Pacific coast on left. Maps used by permission of The Sea Around Us. Low. The only way that Belize could become of significant interest is if a deteriorating situation in Belize began to impact the stability of Mexico. Ongoing. The territorial dispute between Belize and Guatemala is ongoing and unlikely to be resolved anytime soon. The disputes within Belize about the proper balance between development and conservation are ongoing and likely to intensify. 1. World Wildlife Fund; http://www.worldwildlife.org/what/wherewework/mesoamericanreef/index.html; accessed 11/25/2011. 2. CIA Factbook, Belize; https://www.cia.gov/library/publications/the-world-factbook/geos/bh.html; accessed 11/25/2011. 3. "Coral reefs and Global Climate Change." Prepared for the Pew Center on Global Climate Change. Robert W. Buddemeier, Joan A. Kleypas, and Richard B. Aronson; http://www.pewclimate.org/docUploads/Coral_Reefs.pdf P.5; accessed 11/10/2011. 4. World Resource Institute; map of mesoamerican reef and watershed; http://archive.wri.org/image.cfm?id=2684; accessed 11/10/2011. 11. EEZ maps http://www.seaaroundus.org/eez/84.aspx / http://www.seaaroundus.org/eez/320.aspx / http://www.seaaroundus.org/eez/340.aspx / http://www.seaaroundus.org/eez/Legend.htm. Used with permission. 13. Intergovernmental Panel on Climate Change. Climate Change 2007: Working Group I: The Physical Science Basis. 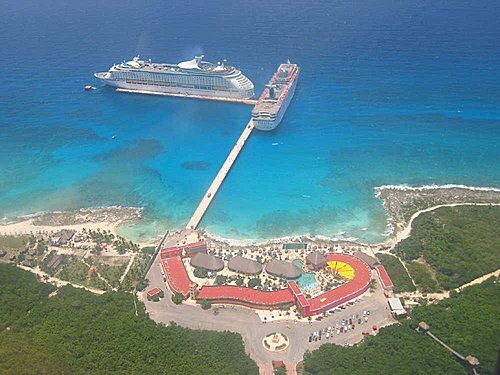 11.9.3.1 Caribbean. http://www.ipcc.ch/publications_and_data/ar4/wg1/en/ch11s11-9-3-1.html. Accessed on November 28, 2011. 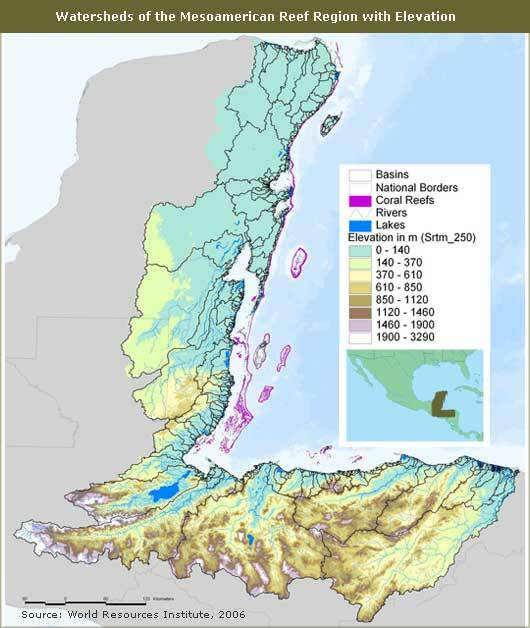 World Resource Institute; map of mesoamerican reef and watershed; http://archive.wri.org/image.cfm?id=2684; accessed 11/10/2011. EEZ maps http://www.seaaroundus.org/eez/84.aspx / http://www.seaaroundus.org/eez/320.aspx / http://www.seaaroundus.org/eez/340.aspx / http://www.seaaroundus.org/eez/Legend.htm. Used with permission.